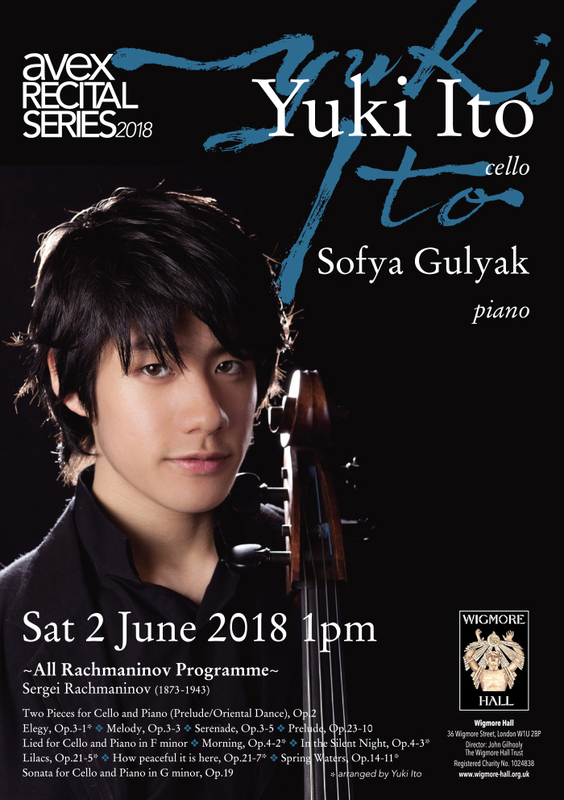 This special concert will feature an all Rachmaninov programme performed by Rachmaninov Specialist and multi award-winning cellist Yuki Ito with acclaimed pianist Sofya Gulyak. 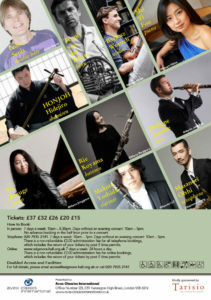 This will be the first time that Wigmore Hall has presented an all-Rachmaninov programme on cello. 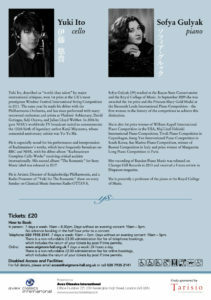 Yuki Ito, described as “world-class talent” by major international critiques, won 1st prize at the UK’s most prestigious Windsor Festival International String Competition in 2011. The same year he made his début with the Philharmonia Orchestra, and has since performed with many renowned orchestras and artists as Vladimir Ashkenazy, David Geringas, Seiji Ozawa, and Julian Lloyd Webber. In 2016 he gave NHK’s worldwide TV broadcast recital to commemorate the 120th birth of legendary author Kenji Miyazawa, whose centennial anniversary soloist was Yo-Yo Ma. He is especially noted for his performance and interpretation of Rachmaninov’s works, which have frequently broadcast on BBC and NHK, with his début album “Rachmaninov Complete Cello Works” receiving critical acclaim internationally. His second album “The Romantic” for Sony Music label was released in 2017. He is Artistic Director of Knightsbridge Philharmonic, and a Radio Presenter of “Yuki Ito The Romantic” show on every Sunday on Classical Music Internet Radio OTTAVA. Sofya Gulyak (39) studied at the Kazan State Conservatoire and the Royal College of Music. In September 2009 she was awarded the 1st prize and the Princess Mary Gold Medal at the Sixteenth Leeds International Piano Competition – the ﬁrst woman in the history of the competition to achieve this distinction. She is also 1st prize winner of William Kapell International Piano Competition in the USA, Maj Lind Helsinki International Piano Competition, Tivoli Piano Competition in Copenhagen, Isang Yun International Piano Competition in South Korea, San Marino Piano Competition, winner of Busoni Competition in Italy and prize winner of Marguerite Long Piano Competition in Paris. Her recording of Russian Piano Music was released on Champs Hill Records in 2013 and received a 5 stars review in Diapason magazine. She is presently a professor of the piano at the Royal College of Music. Avex presents a special Dai Fujikura Portrait concert featuring musicians from around the world, performing works for shamisen (traditional Japanese instrument), toy piano, violin, saxophone, and a quintet of oboe, clarinet, horn, bassoon and piano. This evening of beautiful sound colours and contrasting sonority will also mark several UK premières as well as a world première of a piece for solo piano. Dai Fujikura Portrait looks back across Fujikura’s whole career as far as some works from his time at college. He describes Frozen Heat for Solo Piano (1998) like meeting an old friend. Neo for Solo Shamisen (2014) was Fujikura’s first composition for the shamisen. Until this point he had always associated Japanese instruments as the clichéd music heard in Japanese restaurants outside of Japan. When this work was commissioned he cast aside these preconceptions and carried out extensive research into the history of the instrument. His attraction to the shamisen was the concept of adding ‘noise’ to the sound, something unthinkable in western classical music; he treated this piece like a guitar solo in a rock concert. 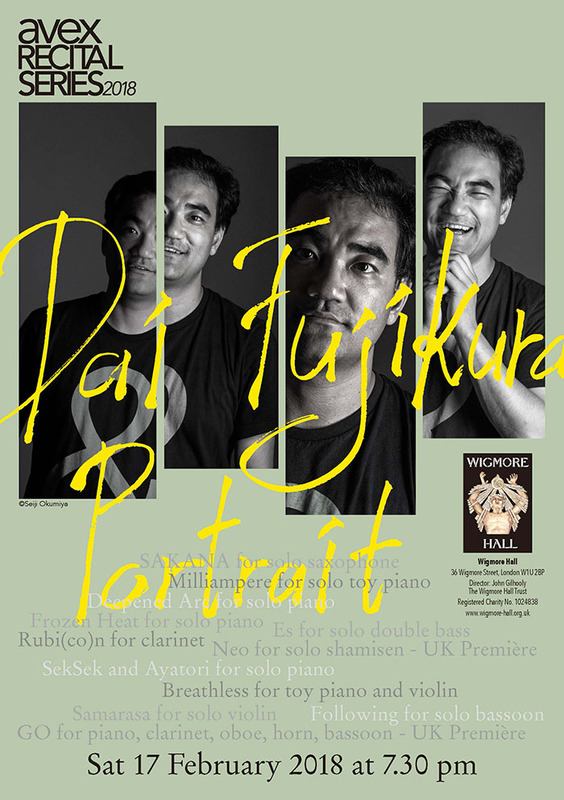 While many of the works have been composed specifically for the artists who will perform them at Wigmore, every few years Fujikura composes for himself which allows him to go back to basics and experiment with new methods and systems. SekSek and Ayatori for Solo Piano (2011) is one such work. With works like this, Fujikura imposes strict limits on the piece. For instance, he might develop a rule where ‘no more than three notes can be played at the same time’, or ‘no pedal’, or ‘right hand and left hand always move together’. Bringing together an incredible range of award-winning musicians from around the globe, Dai Fujikura Portrait offers an opportunity to celebrate the work and achievements of this incredible composer. Dai Fujikura was born in 1977 in Japan and he moved to the UK, aged fifteen. Since then, he has been awarded many important prizes including the Royal Philharmonic Society Award, Otaka Prize, Akutagawa Composition Award, WIRED Audi Innovation Award, the Paul Hindemith Prize, and The Silver Lion Award from Venice Biennale 2017. His works include operas, orchestral pieces, ensemble works, chamber music, and film scores. Having received numerous international co-commissions, Dai Fujikura’s music has been performed in Europe, Asia, and the Americas. He has received two BBC Proms commissions, his “Double Bass Concerto” was premiered by the London Sinfonietta, and in 2013 the BBC Symphony Orchestra gave the UK premiere of his “Atom”. Fujikura has also received performances and commissions from Bamberg Symphony, Munich Chamber Orchestra, Orchestre Philharmonique de Radio France, Philharmonia Orchestra, Tokyo Philharmonic, Chicago Symphony Orchestra, New Japan Philharmonic, and Melbourne Symphony Orchestra, among many others. Dai Fujikura’s first opera Solaris, a co-commission by Théâtre des Champs-Elysées, Opéra de Lille, Opéra de Lausanne, Ircam-Centre Pompidou, and Ensemble Intercontemporain, had its world premiere in Paris 2015. The multimedia production which included dance, electronics, and 3D film was directed by Saburo Teshigawara who also wrote the libretto. Fujikura’s debut solo album, Secret Forest was produced by NMC Recordings in 2012. Since then, he’s had numerous albums produced including Mirrors which features four of his orchestral works, Ice, on the Kairos label, and most recently, Chance Monsoon which he produced on his own label, Minabel in collaboration with SONY Japan. Fujikura also has strong connections to the experimental pop/jazz/improvisation world. Recently, Dai has been named the artistic director of the Born Creative Festival in Tokyo Metropolitan Theater for 2017. He is also currently composer-in-residence at the Orchestre national d’Île-de-France, and artist-in-residence at The Philharmonic Chorus of Tokyo. Winner of the 2013 BBC Music Magazine’s Best Newcomer award, Mei Yi performs prolifically with orchestras across Europe, Asia and America. An avid new music advocate, she works regularly with living composers such as Unsuk Chin and Dai Fujikura, appearing at festivals including the Lucerne, Ultraschall, Punkt, Huddersfield, Hamburg’s “Das Neue Werk”, and as the featured artist at Philharmonia Orchestra’s ‘Music of Today’ series. First shamisen performer to receive the prestigious Idemitsu Music Award in 2014, HONJOH Hidejiro is also a recipient of various awards and prizes. HONJOH strives to create new types of shamisen music while commissioning new pieces. He participated in Ryuichi Sakamoto and Dai Fujikura’s New CD. He currently serves as an Adjunct Professor at the Toho Gakuen College of Drama and Music. With her superlative technique, sensitivity of touch and profound understanding of the music she plays, Yu Kosuge has become one of the world’s most noted young pianists. Regularly appearing at the most important venues and performing with major orchestras around the world, her Carnegie Hall debut recital met with outstanding success with critics praising her “acutely poetic sensibility… wit, drama, and effulgent lyricism”. She currently lives in Munich. Rie Koyama has already won top accolades in many important national and international competitions, including second prize and the special prize for the best interpretation of a commissioned composition at the 62nd ARD International Music Competition Munich in the bassoon category (first prize not being awarded). Koyama is a founding member of Veits Quintet, who was recently awarded Second Prize at the Carl Nielsen International Chamber Music Competition 2015. Having received the 13th Saji Keizo Prize as a member of Tokyo Gen’On Project, Masanori Oishi has worked worked extensively, focusing on contemporary and classical music, but also playing concerts, on television and radio, in addition to recording music for commercials. He is a lecturer at Tokyo University of the Arts, Senzoku Gakuen College of Music, and Toho College of Music. Enno Senft is principal bass and a founder member of the Chamber Orchestra of Europe. Also a principal bass of the London Sinfonietta, contemporary music plays a significant part in his musical life. Senft has participated in various chamber music and contemporary music festivals and has played with the Berliner Philharmoniker, also appearing as guest principal with other major orchestras. He currently teaches at the Royal College of Music. Winner of the ARD Music Competition 2011, Philippe Tondre has also received a number of awards, including the «Beethoven Ring», a musical honour given by the Beethoven Fest in Bonn. Principal oboe of the SWR Symphony Orchestra, Tondre has also appeared as a soloist with major orchestras and is a passionate chamber musician. He is Professor for Oboe at the Hochschule für Musik Saar. A prize-winner at the Bad Harzburg Natural Horn Competition 1989, Teunis van der Zwart is a worldwide ambassador for the natural horn. For fifteen years, van der Zwart was the principal horn of the Freiburger Barockorchester, a position he currently has with the Orchestra of the 18th Century. He teaches both at the Conservatory of Amsterdam and the Royal Conservatory in The Hague. A prize winner at major international competitions including Pablo Sarasate in Spain and Michael Hill in New Zealand, Bartosz Woroch is a committed chamber musician and is a leader of the Lutoslawski Quartet. Woroch has also led, directed and appeared as soloists with the Sinfonia Cymru for the past three seasons. He is currently a violin professor and the Guildhall School of Music and Drama. With his superlative technique, musicality and insightfulness, Makoto Yoshida has established himself as one of the most gifted musicians of the young generation. 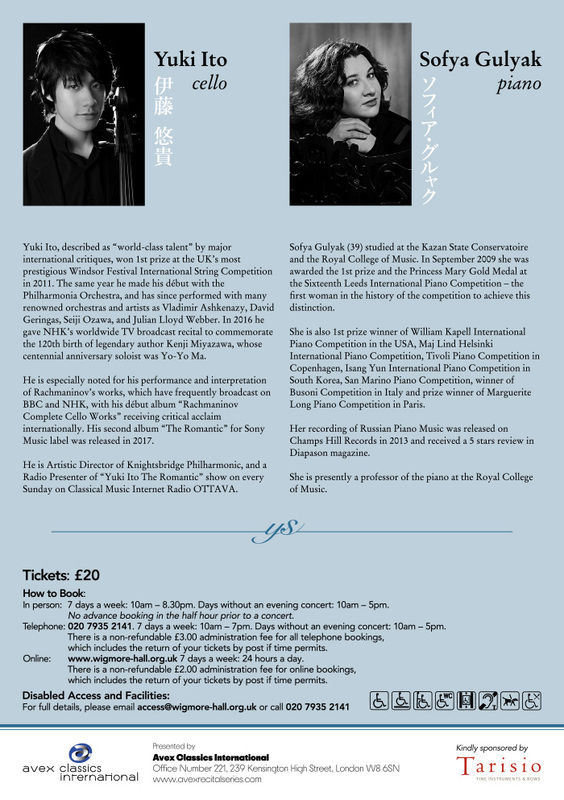 Yoshida has appeared with major Japanese orchestras, has given recitals in various countries and has performed in numerous festivals, such as Saito Kinen Festival and La Folle Journée au Japon. He is currently living in Amsterdam and Tokyo.